Pallytime is fantastic. So is Grubby, who is a much higher level player and extremely knowledgeable. The new map (Alterac) is great, very knife-fight-in-a-phone-boothy when the objective is up. DeVil, I think you might be thinking of the Protector on Volskaya (which isn't particularly new - when was the last time you played?). I think I played it for the first couple of times the last time I played. That must have been around 6 weeks ago. It must just be that it was not in rotation for vs AI matches for a while. yeah, they probably pulled it out of rotation for the Alterac event. Blackheart Bay was out too. Went Kael'thas on Braxis Holdout with friendly Malthael, Nova, Tychus, and Malfurion vs. Butcher/Deckard/Thrall/Medivh/Lunara. The friendly team got uberfacerolled early to the tune of 20 or so kills by 10 minutes. Butcher was at 275 meat around that same time. Meanwhile I was still at 0 deaths and figured the only way we had a chance was to play as safely as possible.... so I did, wandering out only to push lanes just outside the main base or further if I could see Butcher or know his charge was down. The enemy tried to come in or twice and got rebuffed hard and then got scared/disorganized and couldn't figure out how to finish. We were 3 levels down with no keeps left vs. 3 keeps and a fort, but we clawed our way back into it and evened up the game around level 24. We got some momentum by timing a few camp takedowns 30 seconds before bosstime, took the boss as the enemy scrambled to defend the camp mercs, and rolled in for the win after Butcher made a huge mistake by getting killed by incoming merc camps not long before the final assault. I got MVP going 9/14/1 with almost 300k siege damage. Afterward one of my teammates privately messaged me saying he thought I should be playing Hero League cus my map/objective awareness were way better than most players below Diamond. I added him to Friends and chatted a bit. With all the lousy games lately, including how this one started out, I really needed one of these. I love those stories. Did I post up above the story where I kinda feel bad for ruining someone's night or probably forcing someone to rage quit? Well some friends and I were playing at work and we had a few new players on our team. So we had been playing a few games of vs. AI when the leader lost connection and rejoined but someone click on QM. This was our first "and pretty much only" QM. The map was the one where you have to kill 40 enemies at the altar before your enemies to summon a big bad to fight for you. We won the first big bad 40-29 and it was a decent back and forth. I spent a lot of time fighting creeps in the empty lower lane and got a lot of merc camps. I was playing as Kaelthas and doing well but dying a lot from over reaching. The last big bad fight we were trouncing them. The score was 38-13 when 3 of our team wiped. Me and the other team mate were on the other side of the map completely so we figured we'd go and get the last couple enemies we needed for 40. Well it took a long time to get there and it looked like we might not make it in time. The score went 38-17, 38-21, 38-29, 38-33, 38-37 and then we got there. I laid down my phoenix ulti just as the tip of the altar peaked through the fog of war. And then I unloaded everything I had blindly into the area around the altar. My team mate was playing Kel Thuzad and he went around the other direction to the altar, also unloading everything he had. There was so much chaos that were furthered by the eruption of the big bad spawning that we had no idea who won. Well not only did we win (40-39) the big bad but the 2 of us wiped their whole team and launched the base assault our enemy never recovered from. It was glorious. The tension made me salivate. And I can just imagine the frustration and mood swing of the opposing team. They were on the cusp of stealing the big bad from us. They had just wrecked 3 of our team. We were so far away on the map they could taste victory and we completely pull the rug out from under them. I would have been so pissed if I were them. But it was a classic. One of my friends who was waiting to respawn was spectating and cheering the two of us on. It was so awesome because he was watching the stuff I was throwing into the fog of war and couldn't see. Such a great feeling. 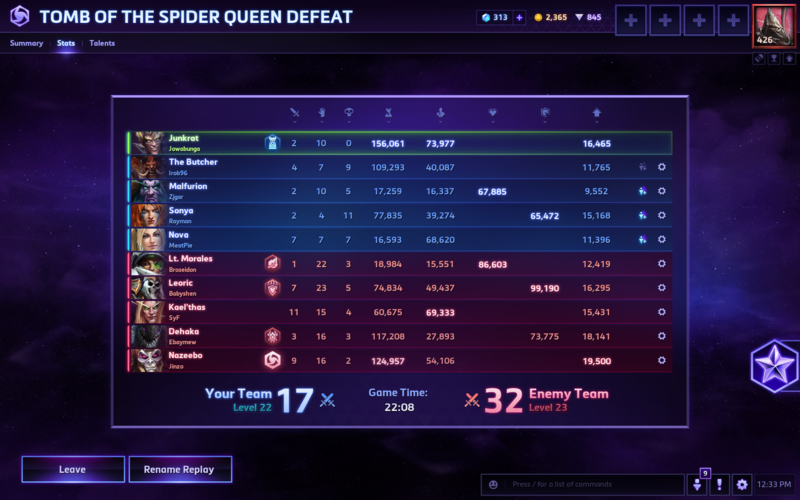 I joked that i should quit HotS because I am never going to be able to match that. We still bring it up at work from time to time. That's great. The game needs more memorable moments like that. Ironically, the dude I referred to and I decided we were both done for the night after that game because it was gonna be pretty hard to top the feeling of coming back like that. Story of my Heroes life. Wow. Someone dying 11 times as Sonya? And other stuff. To be fair our comp was completely outmatched but at least make them earn it ya know? Had a couple interesting back-to-back games over the weekend... The first game was a losing stomp with Ana as we had no tanks or peel and Illidan walked all over us. The second game I picked Arthas for peel and as a counterpick to the current Raynor craze and/or autoattackers. I was fortunate enough to come up against another Illidan and Kharazim that game... very satisfying. I can't think of another time where I've gotten ripped apart by a specific counterpick only to counterpick that same hero the next game. Add Zarya to my list of favorite warriors. She seems really well-suited to dive comps, both for shielding your initiator and protecting your back line against divers. I had a game late last week where I shielded almost 100k damage in roughly 25 minutes, which I didn't think was possible. Combined with a good healer (which we had) that was roughly 220k damage healed/prevented... Crazy time. I cannot get a vibe with Zarya at all. I find her one of the frustrating ones where I can't even really kill creeps with her. Then again things change so much in this game. I have not played her in like 3 months so I'm sure she's changed. She actually hasn't changed much. You should either be sticking with teammates at all times or, if you expect to be solo often, make sure you're either a. sneaking into turret range and shielding to kick your energy up or b. taking the talent that allows your close-range basic attacks to do extra damage ('Feel the Heat'). Provided your intent is sticking with teammates, I like 'Together We Are Strong' as her level 1 talent despite it being the least popular pick (says HOTSlogs) because you can get a little 30 energy boost every time you shield an ally provided they're attacking anything. I hated Zarya at first, but then I read an excellent guide and I absolutely adore her now. To stand still with Illidan wailing on you, and then you see the exact moment when the Illidan players says "oh sh1t", and turns to run away from you. It's glorious. Here's the guide. It's 9 months old, but probably still mostly relevant. I love Zarya. I often find myself at the top of the damage to heroes chart early on because she can stand in the melee and do aoe damage to everyone there and at the same time she is protecting her teammates. I've adopted Deckard as one of my mains but my winning percentage with him in Quickmatch is horrific - probably around 30%. His damage/waveclear are so anemic that if your team can't get it together and take advantage of his amazing crowd control it makes for some long, helpless games. I've had a couple of games recently where I was hitting pretty much every W and E I threw out, but because the enemy realized our damage dealers (if we had any) weren't accomplishing anything they essentially just absorbed my abilities and laughed at me. One such game I finished in the top 5 in a loss with over 2 minutes of root time. At 1.5 seconds a pop that's 80+ heroes rooted over the course of a 20 minute game. Yeah, I took the armor debuff talent at level 1, too. Can't do much more than that. I might give him a break and start trotting out some other Supports for a while. Awesome. Good deckards can really control the enemy team movements but, they do require a team that can monopolize on that. Which is prob why deckard is one of the best supports right now. Goofy, archetypal quickmatch game tonight on Dragon Shire with Lucio with friendly Garrosh, Valeera, Hammer, and Fenix. We start off rolling, I score the first 4 kills of the game, and it turns into a stomp pretty quickly. I'm everywhere, generating kills with speed boosts and sonic bops, and having a generally hellacious game. 3/4 of the way through, with all enemy forts down but the keeps still remaining, I hop in the Dragon Knight and head mid with most of the friendly team bottom. I get a few hits in on the wall there when 4 enemies come rushing out, so I turn to head bot, Qing and Wing as I went to chip the enemy down. A small skirmish happens with Garrosh, me, and three enemies where Garrosh goes down, but I take out 2 of the enemies. With very little health or time left in the Dragon Knight, I swing toward the bottom keep to get some hits in before time expires. The Garrosh player starts asking me what I'm doing, don't come where they are, I'm no skill, etc. "Thank goodness we have pro players like Valeera!" I kept my mouth shut because I felt pretty confident at that point that I had MVP locked down. Game ends, final kill tally 39-9, good guys win. I finish 5-25-1, snagging the MVP, Garrosh reiterates how little skill I have before leaving, Hammer is aghast that she wasn't the MVP... and all is well in the Nexus. Mooosicle: Interesting game last night. It felt like we owned the first 12-15 minutes of that and then... i'm not really sure what happened, even after watching the replay. Seemed like a perfect example of how not to give up in Heroes cus one bad team fight or two later in the game can have a far larger impact than early problems due to the loooooong respawn times. Still, even as the third most popular moba in the market it's encouraging to see the game is still growing. I've been on the opposite side a few times (they dominate us then we win) so I guess it kind of balances out! Anyone playing much lately? I've slowed down overall but got a bunch of matches in Monday night, which to my surprise were much better quality (more competitive) than I was expecting. Still loving Deckard... been trying to pick up Maiev but IMO she might be the most difficult hero in the game to play well and not great for Quickmatch. I'm still playing on Friday nights and doing dailies every 3 days against bots. Sometimes I'll play on Saturday or Sunday too. Haven't been on in a while. They always pull me back for the special events to play x amount of games and earn free stuff. Wow, I just played a few quick match games to play mephisto and the toxicity in those people is astounding. I normally play the draft modes and occasionally find some people that complain but, out of the 3 games in QM all of them had someone I had to mute. I think I will just go back to Drafting and not have to deal with that nonsense all the time. The timing of this is ironic - my last 5-10 games have been the most competitive/fun, least toxic of any I've been in since I started playing, probably. No insta-losing comps, team players, no raging at all, etc. I should be waiting for the other shoe to drop I guess. I turned off chat long ago. People are morons. The Blizzcon announcements include details about the new hero: Orphea. You probably haven't heard of her because she's the first in universe hero they've tried. Personally the Nexus lore they're trying to build is pretty bleh... Just feels too generic and haven't built a compelling enough world for me to invest. I don't think the moba game mechanics are just that compelling to tell a narrative and doing so outside the game feels too much like marketing. What do you all think? 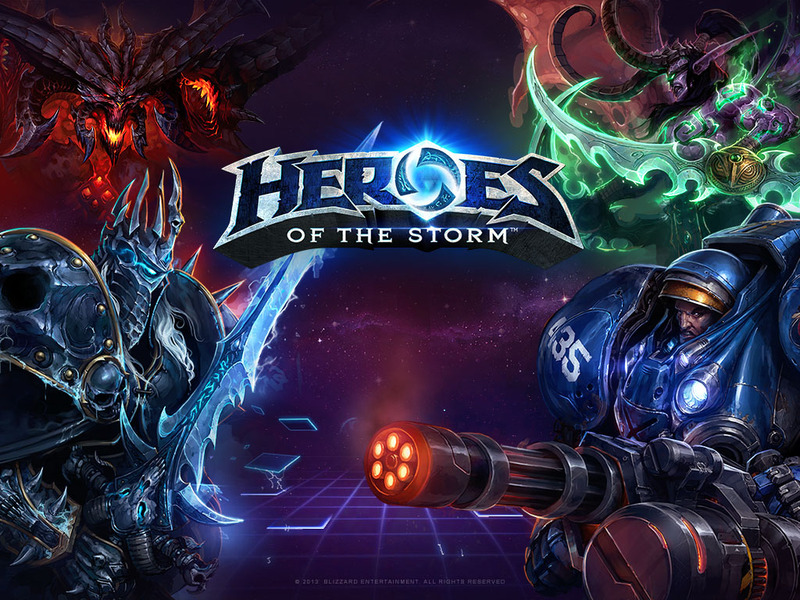 I haven't been spending much time with HOTS because of baby. I like the hero concept though, looks super fun and I will probably be logging back in when she's released if I can carve out some time. Same boat - I find the cool skins coming out of the lore much more appealing than the lore itself. I've been taking a break from HotS for other pursuits but I'll be back. Any word on how Mal'ganis is?